Filling it twice brought the water exactly to the "recommended level" mark on the pool, which I found to be a bit too shallow. The water was definitely too hot after the second fill, so it would have been easy to top-up with cool water without causing the overall temperature to fall too low. In fact, I didn't actually get in the pool for another two hours. I kept a piece of plastic over the top to retain the heat during and after filling. When I came back later to actually get in, the water was still a bit on the hot side. Five hours after my test swim (and almost 7 hours after I had filled it), the pool still felt at least body temperature, if not warmer. Keeping a cover on the pool when it is not in use really helps maintain the water temperature. Zari gives her stamp of approval. She was not happy when we had to get out. I don't think I will need to use a bucket heater to maintain the water temperature, since the pool retains its heat so well. By time the water cools off, I will have a fresh tank of hot water ready. However, I will still test the bucket heater soon, just in case. The pool floor was really cushy and comfortable to kneel and sit on. It is also plenty deep, especially if you fill a few inches higher than the marked line. I would prefer the pool to be longer and narrower, though; I'd like to be able to fully stretch out and float without having to bend my hips or knees. Unless you're in a really large pool, such as the bigger Birth Pool in a Box, you're not going to find this long of a birth pool. I guess I was spoiled with the extra-long jacuzzi tub that I had in my last house! Emptying the pool took 20 minutes. I was very pleased with the pond/fountain pump that I bought recently; it was silent and quite efficient, with a maximum flow rating of 400 gallons/hour. There were just a few cups of water left in the bottom of the pool that the pump couldn't remove; I mopped it up with two bath towels. 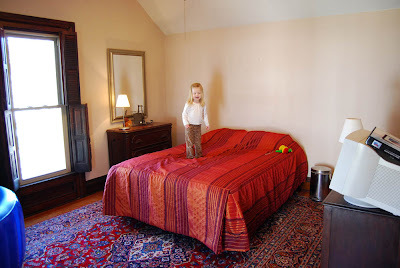 Here are a few pictures of my birth room. It's the only room on the upper floor of our house and has a small bathroom attached (full bath with shower, sink, and toilet). I really want to try that pool next time. I'm interested to see how it works out for you. Does it have handles or am I thnking of another pool? It has handles inside, but frankly they'd be a lot more useful if they were on the top of the pool, about 2-3 feet apart, so you could get into a squat and grab onto them. "stretching out" wise, i really enjoyed the fishy pool. it was huge, i had no problems to extend my legs. and it was only 35 dollars online. Oh, I can stretch my legs out, just not the full body from head to toe. I looked into the fishy pool and it was slightly shorter inside than the La Bassine. Anyway it's not a huge deal, but it sure would be nice to be able to float head to toe, like you do in a real swimming pool. know every woman is different in labor, but speaking from my water birth experience, stretching out is the last thing i wanted in labor. in fact, with my aqua-doula, it was way way too big. i spent some time on hands/knees or leaning over the edge but what i really wanted was to be able to put pressure on the other side with my feet while hanging over the edge. 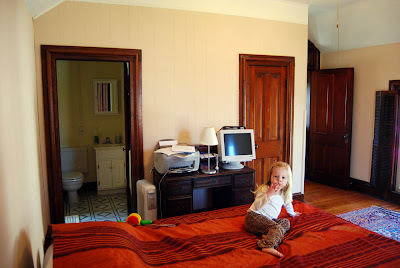 with my most recent birth, i didn't rent a tub but did labor in our big cast iron bathtub. it was too small. something in-between (like your bassine) would have been perfect! i hope you find this is true for you. also, about the temp- body temp was WAY too hot for me in labor in the aqua-doula. it was not a very warm time of year, either- it was october in missouri. i found it way too hot and i hope you find you don't need the heater either. i like how your pool has soft edges. i had bruises for weeks after anatoly was born- on my armpits from hanging over the edge of the pool while kneeling. What a beautiful space to birth a baby. :) I love the La Bassine and we use them for many of my clients. I also have the Sevylor, but it's not as nice as the La Bassine. Glad your test run went well - sounds like you have a great plan of action. in another life I was a midwives apprentice and most every woman at least labored in water. We filled up the pools with as much water from the tap but also boiled water on the stove with whatever large pots they had. it's easy to bring the temp down if it's too high, but hard to warm it up.... the boiling method really speeds up the filling process. Did you notice any fumes from the plastic? No fumes that I noticed. The LB is made without phalates, which is nice. My boys would think they'd died and gone to heaven if I had something like that in my house. Zari looks thrilled, too. :) I don't blame her for being sad to get out. 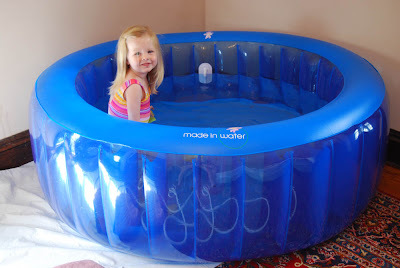 A nice, warm, big pool to play in inside the house during early spring when it's too cold outside - what child wouldn't like that? Your birth room looks beautiful and peaceful, Rixa. I hope your birth is, too. It looks really nice, Rixa-- and how smart to do a trial run, etc. Getting excited for you! Gloria, great idea about the chair. Thanks for the tip. if you float bubble wrap on top of the pool, it keeps the heat in. My midwives with my first baby taught me that trick! I'm surprised you needed a pump. We just use the natural syphoning process. Works well. Once full (I also would fill highter than the line) it tends to turn into a cup cake and a partner can fit in too.